Only limestone walls of Kunas. First place rock climbing is open and equipped with Andrei Varlan in Kunas, since 1972, with Radulescu Liviu, Liviu Omat, Marian Thomas, Gigi Butu, h.. 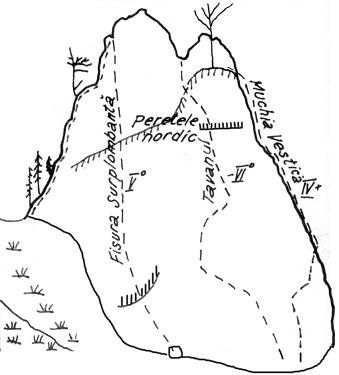 This is a great place to study and workout of climbing, about 10 passes pitonate, allowing you to do various techniques, from climbing on artificial climbing. The routes converge on the platform, refocusing on the tree above the "Ceiling". Before South (15-20m – photo by Andrei Varlan) has 7 matches, and in front of the Northern (25-35m) 3 matches in varying degrees of complexity and ways of climbing. Access route: Is a 10-15 min. Lodge Mountain Red Lodge, Cuicas (yellow stripe). 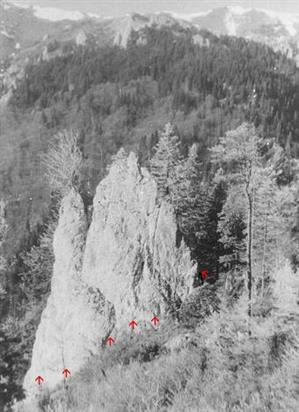 Retreat route: Until 1977 it was with the steering wheel on the 40m tree, at the top, on the account was discovered, the opportunity to go down the air via a hike down to the left, face North.